You may have a previous symptoms or diagnosis or simply want to be proactive in optimizing your child’s health. Choosing a path towards a functional medicine consult at Neuronutrition Associates ensures that the focus will be on either finding the root cause of your child’s diagnosis or focusing on comprehensive primary prevention of disease. After making your appointment, the first step is to fill out the intake forms. We take a biomedical approach of evaluating all health systems ranging from a patient’s medical history from birth, diet, environment (and toxicity load), physiology, pathophysiology, use of medications or supplements, and family/social history. We will review this information prior to your appointment so that we can get the most benefit out of the initial appointment. If you had lab work done in the previous 12 months, we also ask that you gather those for our review. Note: you need a PDF reader to view and print the forms below. You can download one from here. Click here for instructions on how to import your genetic data into LiveWello. During the initial in-person consult with you and your child, we spend one hour thoroughly discussing your child’s history and symptoms, your concerns as the parent, and individualize a targeted approach to treatment. We typically suggest immediate changes with dietary supplements, lifestyle modifications, and/or diet changes. At this visit we may also suggest functional medicine labs to evaluate a targeted concern, such as your child’s gut, genetics, nutritional status, or toxic load. While functional medicine labs are not mandatory for treatment, they do assist us in gathering helpful data that we otherwise will not have. We typically suggest one lab at a time, as we use a systematic approach to investigating the systems of the body that could be causing your child trouble. For example, if a patient has troublesome gut issues, we may suggest a stool study to help us understand this at a more individualized level. We like to see our patients 4-6 weeks after their initial visit. At this time we will discuss any lab work that was completed, recommend a customized plan of care, and plan for how to continue our therapy together. The number of visits depends on the child, his/her diagnosis, and the need for further assessments. Most patients will have an average of 2-3 visits for their initial treatment plan. We also work with therapists and other medical specialists, and can make referrals to those therapies as it is appropriate for the child. After your child has reached their wellness balance we recommend annual visits to support the changes all children experience as they grow into adulthood. 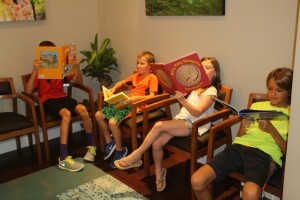 At our annual visits we will make any necessary adjustments to your child’s wellness program. How to Import Your 23andMe Raw Data into LiveWello – This page will walk you through downloading your genetic data from 23andMe and importing it into LiveWello so that our practitioners can analyze your results and build a plan for you. Helping Children Swallow Pills – Sometimes it can be difficult for children to swallow pills. This video gives some helpful tips to make things easier for your child. For some patients, we work with two organizations that provide resources for autism treatment to families in financial need. Please check out the links below for more information. We are not an in-network provider with any insurance carrier. Families with out-of-network benefits can seek reimbursement for our fees and we will provide you the necessary billing documentation. Some of the labwork we order is generally covered by insurance, and more specialized labwork may not be covered, depending on your specific insurance plan. Personal checks, money orders, and major credit cards are accepted, as well as Health Spending Account cards. What if I have already done labwork? Great! We would like to have a copy of any labwork completed within the last 12 months. Do both parents need to attend the appointments? Though not required, we do recommend both caregivers attend the initial consultation and follow up appointments when possible. It is our experience that patient outcomes improve when we work with all those involved in adminstering the plan of care. Do you accept remote appointments? We require that our first appointment be in person at our office in Austin, Texas. We prefer that all appointments are done in person as the exams are important since many of our patients can’t tell us how they’re feeling. However, we understand travel can be difficult so we offer follow up appointments via phone or video chat, so long as we see the patient annually in our office. Does my child need a diagnosis for treatment? No. Whether you child has a new diagnosis, long-time diagnosis, no diagnosis or simply is coming for preventative wellness, we treat children of all ages in various stages of health and recovery. 48 hour notice is required for cancellation; we must charge cancellations received less than 48 hours prior to the appointment time.